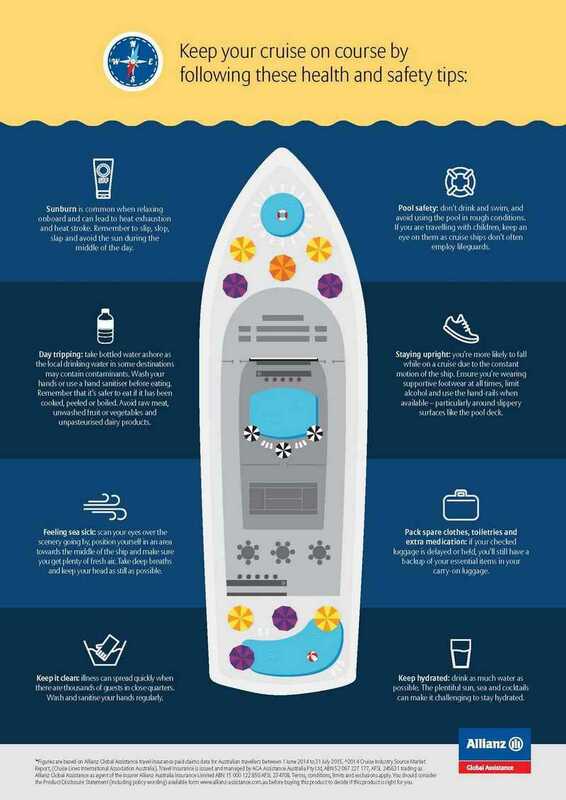 Healthy Cruising: What to know before you go? 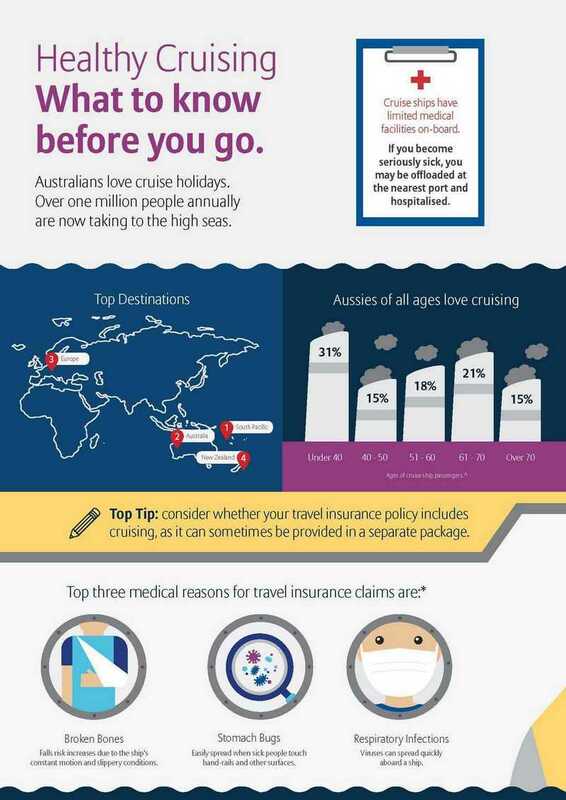 Australians love cruise holidays. Over one million people annually are now taking to the high seas. Top Tip: consider whether your travel insurance policy includes cruising, as it can sometimes be provided in a separate package. Cruise ships have limited medical facilities on-board. If you become seriously sick, you may be offloaded at the nearest port and hospitalised. Broken Bones: Falls risk increases due to the ship's constant motion and slippery conditions. Stomach Bugs: Easily spread when sick people touch hand-rails and other surfaces. Respiratory Infections: Viruses can spread quickly aboard a ship. Sunburn is common when relaxing onboard and can lead to heat exhaustion and heat stroke. Remember to slip, slop, slap and avoid the sun during the middle of the day. may contain contaminants. Wash your hands or use a hand sanitiser before eating. Remember that it’s safer to eat if it has been cooked, peeled or boiled. Avoid raw meat, unwashed fruit or vegetables and unpasteurised dairy products. Feeling sea sick: scan your eyes over the scenery going by, position yourself in an area towards the middle of the ship and make sure you get plenty of fresh air. Take deep breaths and keep your head as still as possible.